It’s rainy season here in Accra, and several areas of town flooded today. Our area is fine, but we were warned to be careful getting home. Here, the terrace below is flooded and the power is off, but we have a generator running, so no complaints here. It is tough here for people when it floods, it’s just a year since many were killed in floods/fire in Accra. Even today, despite what politicians say about better infrastructure and drains being cleared, the city is not coping well with heavy rainfall. My husband is on his way to France for a week of the Euro 2016 football, so I am being slovenly in the kitchen. My last dinners have been a) an omelette (I started well) b) a tin of baked beans, eaten cold, then leftover baklava c) an ice-encrusted mystery box from the freezer, which turned out to be lentil soup. I am not the best at cooking alone, so I was so happy when the new neighbours just invited me to join them for Ethiopian tonight. A proper meal! Maybe I’ll make another batch of these muffins on the weekend and bring them over to the neighbours. Yes, almost like the mango muffins with streusel recently. And I’ll have a think what to cook soon for another set of neighbours, who are fasting for Ramadan. Something spicy with chickpeas and chicken, I think, served with red Ghana rice. Hmmmm, lots of possibilities! In the interim, might I offer some muffins? Preheat oven to 200 C and line a 12-count muffin pan with muffin papers. Dump all muffin ingredients except fruit in a bowl and stir until it just comes together, then stir in mango. Spoon the batter into the 12 muffin papers in tin. Bake for at 200C for 15 minutes or so, until muffin tops are golden. Almost time for dinner — and we might just try Uber, it just launched here. It might be easier to hail a normal taxi, but no harm in trying. We’ll stay in higher-lying areas, though, more rain on the way. UPDATE, three hours later: Well, no Ethiopian dinner. We had barely left our compound before the rain returned, and it soon became torrential. Not many taxis out either. No point in getting stranded in the dark, so we went home again, pooled resources and had a great dinner of grilled cheese sandwiches, Greek salad and popcorn. Very nice indeed. The power has been out for eight hours now, so the roar of several generators can be heard across the walls – otherwise the city is very dark, and very quiet. I can hear the toy horn honks of a couple street vendors with their hand carts, taking advantage of a lull in the rain. Hopefully better weather tomorrow. This entry was posted in baking, food, Ghana and tagged living in Accra, mango, muffins on June 9, 2016 by krumkaker. I am just back from Dar es Salaam, a quick work trip to Tanzania. 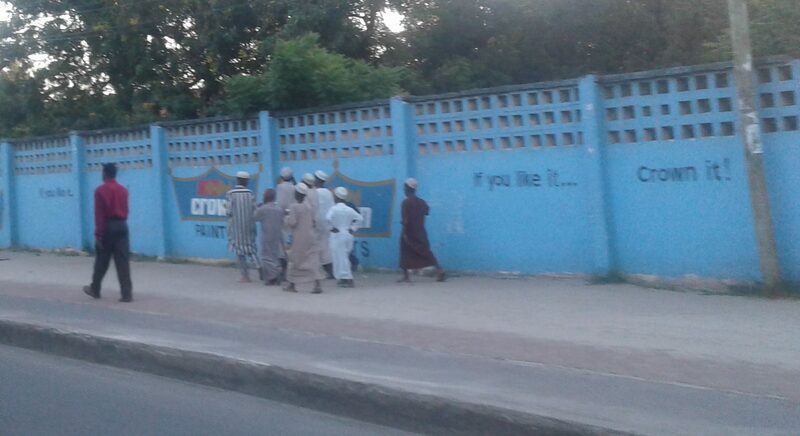 Lovely cool breezes, nothing like the sticky Accra climate, and such nice people. Miles of beaches, many new buildings; its gotten very modern since I was last there. Actually, it was less palm trees and Indian Ocean breezes, and more airport-hotel-meeting room-long days-airport, then hours of swatting mosquitos while waiting for the check-in to open for the 03:46 flight Dar-Addis-Accra (arrrgh) with plenty of time to full out departure/arrival forms. 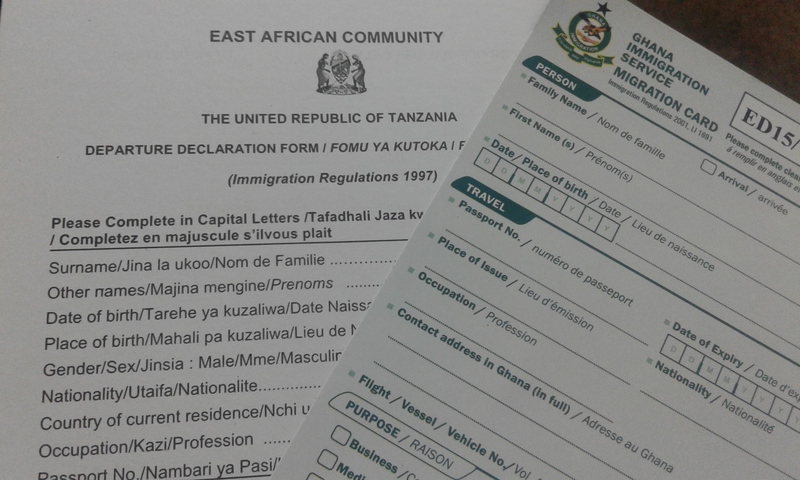 Where do all of these departure/arrival forms go? In some massive archive somewhere? Or do they get shredded eventually? Later, a large group of people clutching plastic bags and puffy jackets showed up in Departures: families with small children, 85 people being shepherded by IOM staff in blue vests with clipboards: the families were refugee/migrants, migrating to the US and Canada, with what little possessions they had in large checkered plastic bundles. A few extra hours for me waiting on plastic airport chairs is really nothing too complain about, when you think about how these people are some of the lucky ones. We stopped off at a market the last day, on our way to the airport – these are tinga tinga paintings. Still there! 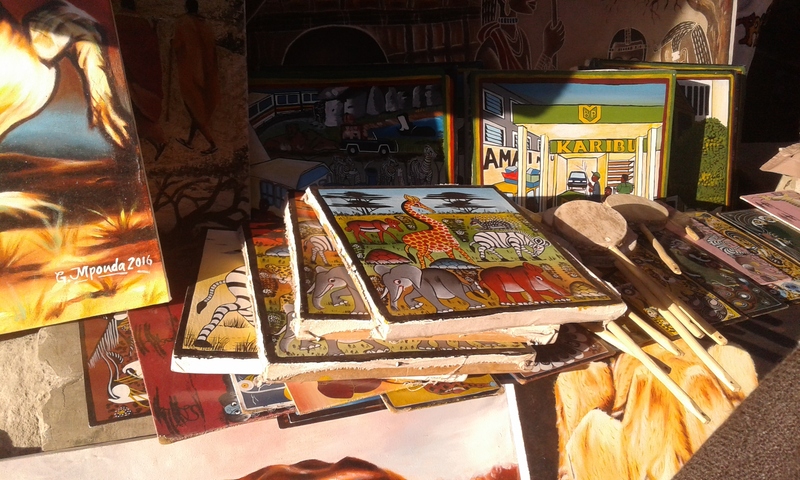 It’s a very local painting style from Dar, quite touristy but cute. I have some from twenty years ago, and they are still popular. No shopping for me though, enough stuff in my life already. 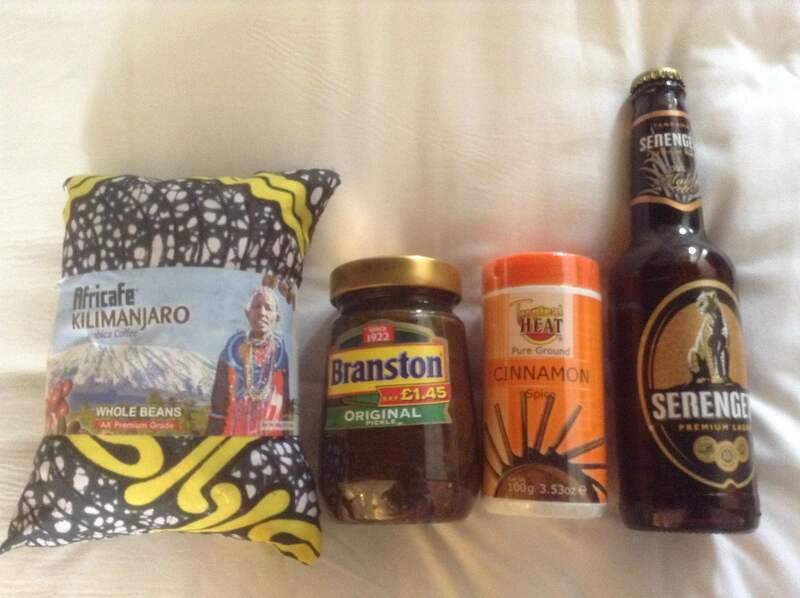 What I DID buy in Dar es Salaam: coffee, Branston pickle , ground cinnamon, and Serengeti beer I optimistically thought I’d have time to enjoy. Not the case. The Branston pickle is for my husband, he brought one jar to Accra and it’s getting very empty as we have not found it here yet. Now his cheese and pickle sandwiches are safe for a while longer! 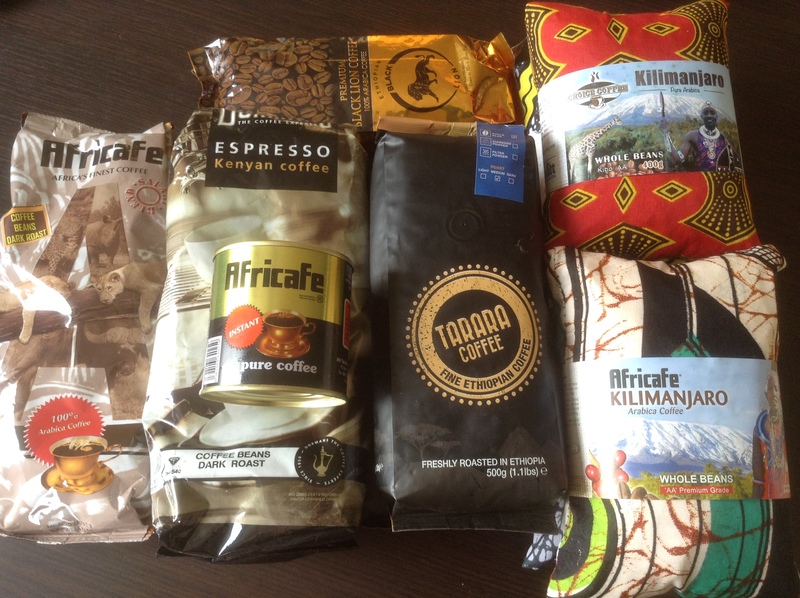 And of course, I bought coffee beans….. Tanzanian, Kenyan, and Ethiopian, most at the airport in Dar es Salaam and Addis Ababa. The latter was full of cheap Chinese cigarettes and alcohol, but in tax-free shop number six I found freshly roasted Ethiopian coffee beans, very nice. We have been enjoying them for our morning cappuccini, you can really taste the difference in beans. No need to buy insanely expensive Italian espresso when there is more local coffee available, though Ghana may not be a coffee hotspot yet. And one little tin of Africafe, instant coffee for old time’s sake! This entry was posted in food, travel and tagged coffee, food shopping on June 3, 2016 by krumkaker.